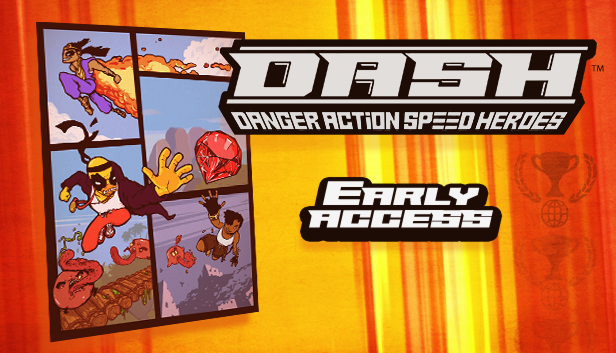 DASH: Danger Action Speed Heroes has been over a year on the IndieDB and has seen some tremendous changes. With the last three major updates (February - April) we have seen some of the most important and interesting features come alive and all in the while the Discord server is growing as we are getting closer to Early Access Launch Q2 2019 (release date reveal coming up!). Welcome to DASH by Baby Duka and Schubell IT. DASH is a speed and precision-based game where it's fun to smash stuff and make amazing jumps. There is great deal made especially for fans of pixel platformers but with more action and stereo-based audio with juicy effects. A little from the old school and a little from the new. That's why it's a good time to join the server, get a beta key (Steam, Windows/Linux) and get going! Alphabetagamer.com thinks so too. Here's a great article and teaser to get into the beta. "DASH has more of an emphasis on speed [...], with fast paced Super Meat Boy-esque platforming physics and players competing to speedrun through levels as fast as possible"
We hope you would like to join during this special period where we really shape the presentation of DASH and make sure the game is as good as it can be! The pre-order page of 2URVIVE is available on XboxOne and Steam now. We thought it was a high time to start a series of regular Be The Ruler devlogs. Because things happen and you should know about them. How does it fare on Windows 10? I am on an Android tablet and I am trying to dowonload it but I can't find the link to a website or a download button. Please help. you cannot download Game Maker or develop for it on android. It must be a PC, Mac or linux. This engine is great for beginners like me, and it versitile enough for even the pros. I recommend this for anyone who wants to learn more about making games.